Recently, it is possible to grasp the spatiotemporal distribution of people in cities using population statistics based on the location information of mobile phone users. However, it is difficult to know their purpose of stay which varies according to the use of building they stay and their detailed attributes such as age and gender. 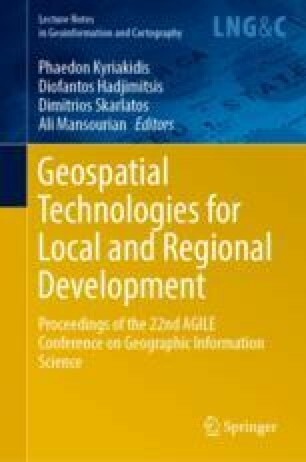 In this paper, we firstly propose a model that describes the number of people staying inside/outside of buildings by considering the population density that varies according to the use of building, time, and local characteristics, by using GIS database and Mobile Spatial Statistics (MSS) which is one of the population statistics of mobile phone users. Next, we integrate the MSS data and the Person Trip survey data (PT data) which include detailed personal attributes as well as the purpose of stay. Using the integrated database, we demonstrate the advanced use of population statistics based on mobile phone users by addition of purpose of stay which varies according to building use. This paper is part of the research outcomes funded by KAKENHI (Grant Number 17H00843). The authors wish to express their sincere thanks for valuable comments from anonymous reviewers of AGILE 2019.